NWGIC researchers have access to greenhouses, growth cabinets, a bird proof cage and a rhyzolisimeter for the in‑depth study of both vine and grape metabolomes, plant functioning and to understand the complex mechanisms of organ, tissue and cell responses to abiotic and biotic factors. A small on-campus experimental vineyard is also assessable. The experimental winery and winemaker provide the expertise and facilities to produce triplicate small-lot wine trials that underpin most research programs. A comprehensive suite of analytical equipment is available on campus which provides state-of-the-art chromatography facilities with high end detection and feature identification capacities. A combination of targeted and untargeted analysis coupled with chemometric and metabolomic data modeling skills complements the analytical capacity available to researchers. Molecular and genetic analysis for the detection and characterisation of pests and disease-causing organisms is conducted by a comprehensive range of expertise and specialised equipment. CSU and DPI NSW continue to support the development of the research infrastructure of the NWGIC. 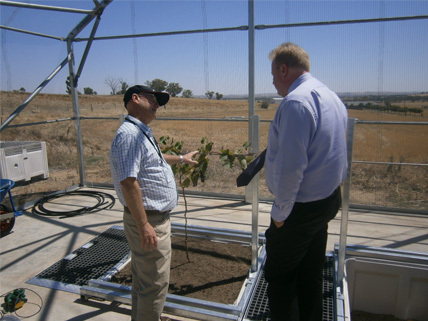 Following the recent completion of DPI NSW funded ($1.4m) state-of-the-art glasshouses and bird proof micro vineyard, CSU funded a research laboratory building and upgrade of the wine sensory teaching laboratory ($9.4M). CSU's multi-million dollar National Life Sciences Hub (NaLSH) for teaching and research on the Wagga Wagga Campus is now fully functional. The facility will enable further research and training in the national priority areas of food production and security, plant and animal sciences, animal health and water and environmental sciences.